Issue #212 • October 26, 2015•Sold Out! The summer of 1986, the summer I was fourteen, my parents went to the Dordogne for eight weeks. My father had been unwell, and it was thought that France, where he had studied as a young man, would enable his recovery. Through the university’s employment office, my mother hired two sophomores to house-sit for the time they would be out of the country. As I came with the house, these two college boys were obliged to take care of me, too. We lived at the end of a short street in a quiet neighborhood. Our house was big and gray, exceptionally large for three people, though I didn’t realize that until Ed and Grant arrived in a maroon Pontiac that first afternoon and my parents drove away. The two boys stood responsibly beside me as we waved them off. Grant might have murmured something consoling as they disappeared around the corner, about how they’d be back before I knew it. And then, after a respectful pause, they let loose. Lily King is the author of The Pleasing Hour, The English Teacher, Father of the Rain, and most recently, Euphoria, which won the inaugural Kirkus Prize for Fiction and was a finalist for the National Book Critic’s Circle Award for Fiction. King is the recipient of a Whiting Writer’s Award, two Maine Fiction Awards, and two New England Book Awards. She lives wither her husband and children in Maine. LK: About ten years ago I was in a restaurant in Portland, Maine and I ran into a guy I had known when I was a teenager. I was with my husband and kids and we just talked to him briefly, less than five minutes. But in the course of that conversation, he mentioned that when he was a boy his parents had gone on a trip and hired two college kids to take care of the house. The sentence he used next, and that stuck with me for years, was “And since I came with the house, they had to take care of me, too.” I knew I would use it someday. LK: The story came out fairly easily, but the challenge was in the editing. I was in the middle of writing a novel when I wrote it, and novels are more elastic—they can handle changes (and mistakes) better than stories. A story is so compact that the slightest alteration makes the whole thing shake. HT: What can you tell us about the Dordogne itself, as a place? Why did you choose to have our narrator’s parents head there? And why choose it as the title for the story? LK: I think around the time I was writing it my dear friend Dominic, who travels the world relentlessly while I am mostly home with my family, was heading to the Dordogne and urging us to join him. We couldn’t go, so I sent those characters there instead. HT: Grant and Ed are such amiable characters. How did you come up with them? And in your mind, was this summer also a marker in their lives? LK: I have never thought about this before, but I think perhaps they are a bit like my older sister and brother. Like Grant, my sister, Lisa, is nurturing. She took me in whenever I need a place to live, fed me, cared for me. Like Ed, my brother Apple is quick and sharp, misses nothing, has a quip for everything, and like Lisa has a tender, generous heart. They are seven and eight years older than me, so I sort of discovered them when I was a teenager. This summer is a marker in Ed and Grant’s lives. I think Grant is realizing both that he is love with Ed and how hopeless that love is. I can’t help feeling that that tussle they have in the pool is just the beginning of this tension between them, and that their friendship might not last because of it, if they aren’t able to be honest with each other. HT: Woven throughout the story (but offstage) is the father’s breakdown. Was his suicide attempt always a part of the story? LK: Yes, though in edits with One Story, it took on more importance. At first it was withheld, just mentioned almost in passing at the end. I always try to minimize this kind of thing, and editors often have to pull more of the story out of me. HT: This story is being told from a distance—the narrator now a grown man, looking back. “I continue to look back, as if rereading a book I was too young for the first time around...” Why did you choose that distant POV? LK: From the very first sentence that’s how the story came out. It was essential to the narrative voice, this distance, and this fondness for a moment in his past. I thought of the work of Peter Taylor as I was writing it. I haven’t read a lot of Taylor, but there’s a formal tone to this narrator that reminded me of him. In this case, that formality, I think, comes from this boy having been raised by much older parents who rarely spoke intimately or colloquially with him, and while he does manage to overcome these emotional obstacles, his speech retains a bit of their stiffness. HT: This truly is a story about a heart learning to sing. Can you talk a bit about your approach for writing about happiness? It’s so difficult to pull off on the page, and feels very risky, but is also so refreshing, for an author to take this tack in their work! LK: If I had known it was a story about happiness when I started writing it, I’m sure I would have balked. Happiness doesn’t often make much of a story, though I fell in love with Mary Lavin’s “Happiness” years ago and marveled at how she did it. As I said, all I had when I started was that line about coming with the house. I had no idea where it would go. I just sort of followed Ed and Grant into the house. And they brought so much joy, so much life, with them that they made me see how dead this boy’s world had been. Like the reader, I didn’t expect the first real care and tenderness that he ever received to be from two college boys. Part of the happiness is just that, getting something so meaningful from a place you least expect it. I feel like I’ve had moments like that in my life, and I think back on them with a special sort of pleasure. LK: When I was taking a break from my novel Father of the Rain, which I often had to do because it was an emotionally intense book to write, I decided to write a short story a day. You can imagine how that went. 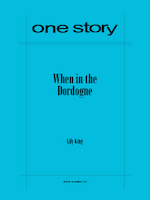 I think the first story I wrote took a week, and the next was “When in the Dordogne” which I got about halfway through after another week, then it was time to go back to the novel. So I set the story aside for nearly a year, then when I was on another break, I went back and finished it. LK: I’m working on another short story that was inspired by something a woman in Germany told me last July. Also, the necessity of getting that vicious critic in your head out of the room while you’re writing a first draft. You have to give yourself freedom to write with impunity, to play, as I heard Jim Shepard tell an audience last weekend. That playing without judgment is essential. It’s also where the joy is.